Friends of mine have been raving about these banana pancakes for months but I wasn’t convinced. Last week I tried them for the first time, not expecting to like them. I had visions of them being like those awful cloud eggs that were everywhere on insta last year, but they’re delicious. They’re perfect for anyone who needs a change from savoury eggs for a fast protein-packed breakfast. I love a good pancake and have shared my traditional English pancakes and my grain-packed American pancakes before. But these banana pancakes are so fast so they’ve become a regular in our house. They also work for anyone who is avoiding gluten, dairy or carbs – none of which I’m avoiding by the way. Don’t just keep them for breakfast – they’re a great healthy dessert too. My boys love them. Mash a ripe banana in a bowl until it is really mashed and starting to be almost liquid. Add 2 eggs to the bowl along with a pinch of sea salt and whisk together. The sea salt makes them taste sweeter – trust me. Heat a teaspoon of butter or oil in a large non stick frying pan. Use a ladle or a cup to pour the mixture into the hot pan. I make 4 pancakes with this quantity but you can make one big one. Bigger ones are trickier to flip though. Leave to cook on a medium heat for around 3 minutes. Because of the banana they will burn if the pan is too hot. Once the pancakes have set, use a spatula to turn them and cook for a minute on the other side. Serve immediately. 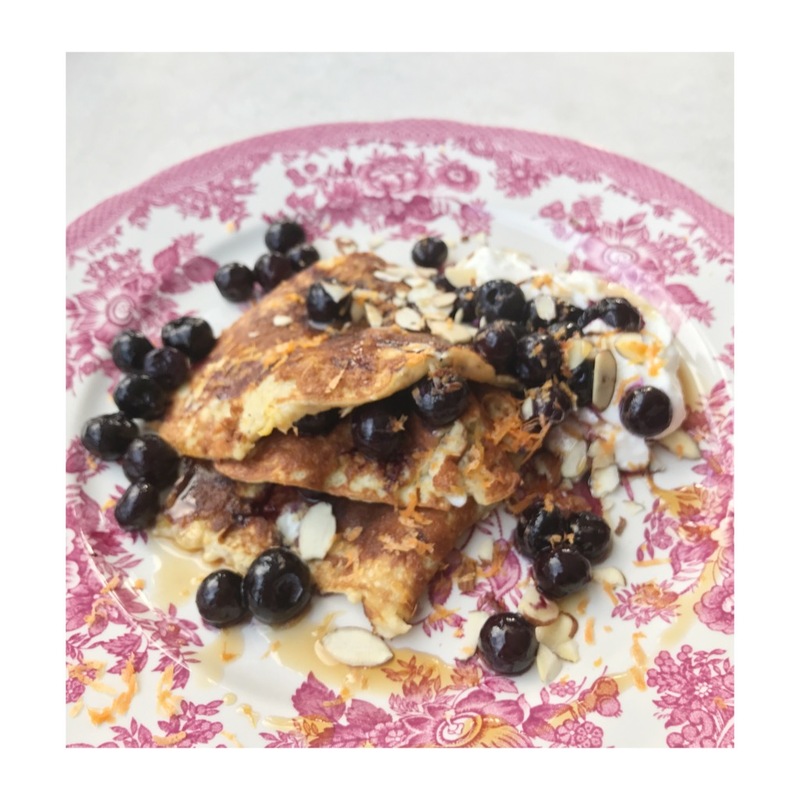 They’re great just with maple syrup and yoghurt but my favourite combo so far is frozen blueberries (heated in the microwave), toasted almonds and grapefruit or orange zested over the pancakes right before eating. Find more of my brunch, breakfast and banana recipes here.